What does Obama's victory mean? Responses from a platoon of reporters, bloggers, commentators, academics and policy wonks on the meaning of Obama's victory. A man signs a message board dedicated to President-elect Barack Obama in front of Lincoln Memorial in Washington, Nov. 6, 2008. 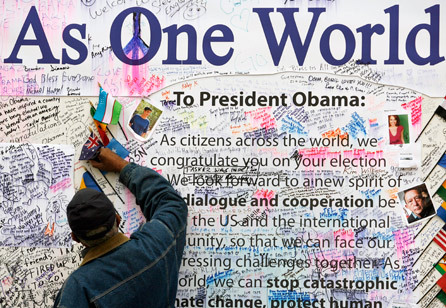 Everyone agrees that Barack Obama's election sent a powerful message to the country and the world, that it was and is a meaningful moment. But what, exactly, does it mean? I solicited a platoon of reporters, bloggers, commentators, academics and policy wonks on what they think it means, forcing them to winnow down their answers to a single sentence that begins with the same two words: "It means ..."
Here are more than three dozen responses, sorted alphabetically. Some are funny, others serious; many are poignant, a few are edgy. It means we can see the end of Nixonland from here. It means "hope" is not a four-letter word ... but "Bush" is. It means you can run for office no matter your name. It means the long national nightmare is over. It means that after years of splintering divisiveness, we're back in this together again. It means Americans are starting to realize that there's nothing compassionate about conservatism. It means the Union won, with unions. It means the era of conservatism is over. It means that this damned thing [conservatism] doesn't work! It means the 9/11 era -- of dealing with the world 9/11 created rather than using 9/11 as a political club -- has finally begun. It means that James Cheney, Michael Schwerner and Andrew Goodman did not die in vain. It means that my two sons will grow up in a country where everybody knows that an African-American can become president. It means the Democrats have two years to show they can govern through effective, progressive policymaking … tick, tick, tick. It means that, following the political equivalent of locusts, the plague, the trials of Job, and 40 years (more or less) in the wilderness, it is actually fun to be a Democrat again. It means the world is ready to follow if America is ready to lead. It means that we grabbed the steering wheel and pulled on the hand brake just before this bus called the U.S. of A. careened into the abyss. It means that the Republican Party has to give up appeals to coded racism and accept the reality that United States is a multiethnic democracy. It means that the conservative era is over, and a progressive one has a chance to begin. It means Barack Obama now has earned the additional challenge of showing that he's not Bill Clinton, circa 1993, and that 2010 won't be 1994. It means that the voters will punish incompetence, even at the cost of voting for intelligence and eloquence. It means that the 9/11 era is over. It means the arc of the moral universe is long, but it bends toward justice. It means at least three Supreme Court justices who aren't vetted by the religious right. It means the end of the great national nightmare that began on April 12, 1861, when Americans began the long struggle to determine what an American is -- that the hue of a citizen's skin does not determine their value to themselves and their fellow citizens of this great experiment. -- Robert Mackey, historian and consultant, Washington, D.C. It means that sometimes being "pro-America" means different things to voters than to politicians. It means that I will see a Latino president and Supreme Court justice in my lifetime. It means the North has won the Civil War. It means market fundamentalism no longer has a veto and it is now possible to build an economy with widely shared prosperity. It means America is not afraid! It means there is more to America than is dreamt in Karl Rove's philosophy. It means that the term "proud conservative" is now more toxic than "San Francisco liberal" ever was. It means the Democrats have a once-in-a-generation opportunity to make good on some bold promises. It means national conversations about sexism and homophobia are up next. It means, as a friend in Tbilisi, Georgia, said to me today, that our nation managed to "push the reset button," and in one action, revived all the wonderful, idealistic overtones that go with the word "America." It means power even that seems at times absolute is ultimately fleeting. It means, as ever, that America is capable of surprising itself -- and the world. It means I can start watching State of the Union addresses and presidential news conferences once again, without feeling embarrassed. It means Barack Obama will be able to get a cab in New York anytime he wants. It means that some right-wing entrepreneur will be on the market with the "Obama Countdown Clock" within the week. It means that we can finally have someone represent the black community to mainstream America who isn't Jesse Jackson, Al Sharpton or wearing a summertime fur coat and platinum chains. It means sunset has arrived after Reagan's morning in America, and it's now the optimistic dawn of a bright new day. It means the beginning of the end of a nightmare that began on Nov. 4, 1980. It means that principled, visionary domestic and foreign policy need not come at the expense of morality and justice.